In one of this year’s most shocking rock stories, AC/DC drummer Phil Rudd has been charged with attempting to hire a hit man to kill two men. He’s also been charged with possession of methamphetamine and cannabis. During this shocking time, we’ve been waiting for an official statement from AC/DC, and earlier today (Nov. 6), the band addressed the issue. Questions on Phil Rudd’s involvement with AC/DC came into question after the drummer chose to skip a recent video shoot for two songs off AC/DC’s upcoming ‘Rock or Bust’ album. Rudd was also absent from the band’s most recent publicity photo (seen above). According to New Zealand outlet The Sun, Rudd was accused of procuring murder between Sept. 25 and 26. According to the Fiddaman Blog, the AC/DC video shoot took place on Oct. 4. We’ve only become aware of Phil’s arrest as the news was breaking. We have no further comment. Phil’s absence will not affect the release of our new album Rock or Bust and upcoming tour next year. Rudd’s legal troubles act as another huge blow to AC/DC, who were forced to part ways with guitarist Malcolm Young after the founding member began to suffer from dementia after having a stroke. 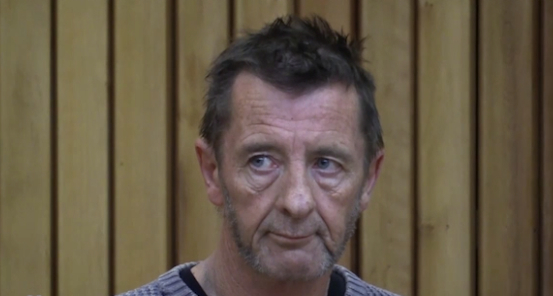 Phil Rudd will make his next court appearance on Nov. 27. If convicted of the murder-for-hire charge, Rudd could face up to 10 years in prison. AC/DC’s ‘Rock or Bust’ will see a Dec. 2 release date.